Here are 5 conversation starters to try with your child when arriving at your hotel. “What floor is our room on?” Talk about how the number of the room tells you what floor your room will be on during your stay. Then let them find the right button to push on the elevator. “How many stairs do you think it will take to get to our floor? Let’s count.” If your child is terrified of elevators (like one of my daughters), use the stairs to practice estimation and counting. “Can you help us find the room?” When you get out of the elevator or off the stairs, tell your child the number of the room and point out the sign (like the one pictured above). He/she will have to use their number sense to figure out which direction to go. If they get stumped, you can talk through it with them and figure it out together. 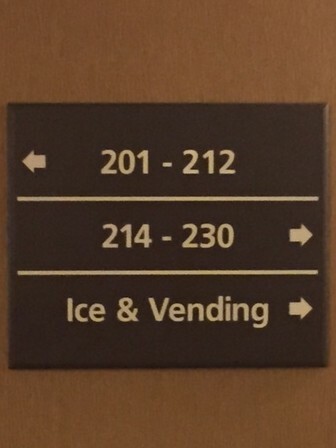 “Do you notice any patterns with the room numbers?” Many hotels have the odd numbered rooms on one side of the hall and even numbers on the other side. “Have you seen anything that you want to do while we are here?” This could lead to a conversation about anything from swimming in the hotel pool to checking out a local attraction that they saw on a pamphlet in the lobby. What are some ways that you incorporate learning when staying in a hotel? *It’s important to note that I can probably see these things because I’m not preoccupied with trying to keep our girls from touching things they shouldn’t. I never knew that a hotel could have so many learning experiences! Thank you for pointing that out to me even if I am not a parent. We also have them look for familiar letters in the signs, not to mention the menus when waiting for the food in restaurants! My favorite has to be allowing them to grab pamphlets. For some reason they truly enjoy it, even the oldest (she’s 12)! I let them put them in order from most wanted attraction to least. Then, depending on our budget and time, they have to both AGREE on an attraction to visit each day.